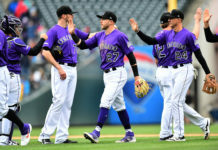 After hearing Trevor Story didn’t earn the last vote to get into the All-Star Game in San Diego, Gerardo Parra threw up his hands and stormed off into the showers in the Rockies clubhouse yelling a mix of Spanish and English that in good conscience shouldn’t be repeated. 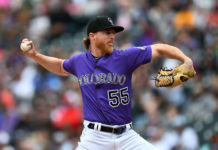 While Story was much more reserved than the Rockies’ candidate for President, he still expressed some disappointment after coming third in the All-Star voting behind Brandon Belt and Starling Marte. This is the third year in a row a Rockies player has been on the final vote ballot and not made it into the All-Star game. Troy Tulowitzki made it last year as an injury replacement. There are simply more people to vote in major markets and for a player in Denver to make the game, they will most likely need more than deserving play. Story has 21 homer runs to his name, tying Albert Pujols and Dave Kingman for the most before the All-Star break in a rookie campaign. Corey Seager (Dodgers) and Aledmys Diaz (Cardinals), both very deserving NL All-Star rookie shortstops, are putting up similarly gaudy stats as Story. The difference may be that their teams have winning records. One of the biggest operatives of the #StoryTime campaign was manager Walt Weiss. Weiss said he texted N5 several hundred times to get Story to San Diego. Although it wasn’t enough, he said winner Belt is deserving but expressed similar disappointment about his shortstop. Getting this close to the All-Star game has motivated the shortstop even more. Story’s 21 homers are more than he has hit in any of the campaigns he put together in the minors. Story said that all of the voting was a little bit of a distraction from his play but nothing overwhelming. 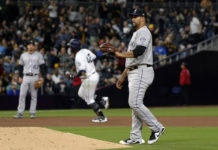 He was thankful for the fans and the Rockies’ social media team for support as well as fellow Denver athletes Emmanuel Sanders and Jamal Murray for spreading the word. He said that all the support from Canada was the most surprising aspect of this process considering he has never been to the country. Story is appreciative of any support he can get. Regardless of result, Story’s numbers are worthy of any All-Star. Now, in an election year, Weiss said that it’s back to the “Parra for President” campaign. Getting back on the field is the first step for Parra, who went down with ankle injury on June 14. Weiss said he ran today for the first time since going on the DL.